Apart from the black and white screen that came with the standard one, you could also get larger 14" colour monitor. You could also attach by ribbon cable an additional plug-in double external 3.5" floppy drive. I used to maintain these for British Telecom and have the technical manual. I used it for many years, extracting info from Prestel network. 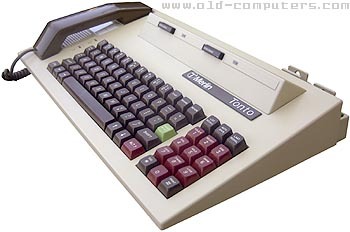 Lovely machine - nothing to match even today, with the built in handset on the keyboard. You could also use it hands free, with loudspeaker. I recently noticed the rather bizarre T on the Merlin Logo. I knew I recognized it somewhere-- Then it hit me. That T is the 2nd half of an old BT logo... that's probably why there's a phone attached, I suppose. The Tonto was pretty unreliable - powered up all the time, the PSU's eventually died. The microdrives were less than perfect too. You could get expanded rom packs including more memory, but most common was the Exchange rompack which included the Psion Exchange office suite. Quill was excellent! These were sold through BT local area sales as well as into bigger projects through BT Field Services. The bigger projects included Customs & Excise at ports and the Home Office Prison Services (HOPS) project. The tape drives were unreliable! PRICE �1,500 at start. Sold to British Telecom staff for �100 complete when BT stopped to maintain them. see more Merlin Tonto Ebay auctions !